I could never live without EHB. Everytime I get a hint of a cold or sore throat I take a few and it just stops it dead in its tracks. Recommend it highly. EHB by Integrative Therapeutics was prescribed by a naturopath for my dh's nagging cough. Unsure if cough is from allergies/cold but just happy to find something that worked! EHB by Integrative Therapeutics was the most significant supplement that I've taken in helping me heal from a sinus infection. Easy to use and prescribed by my naturopathic doctor. 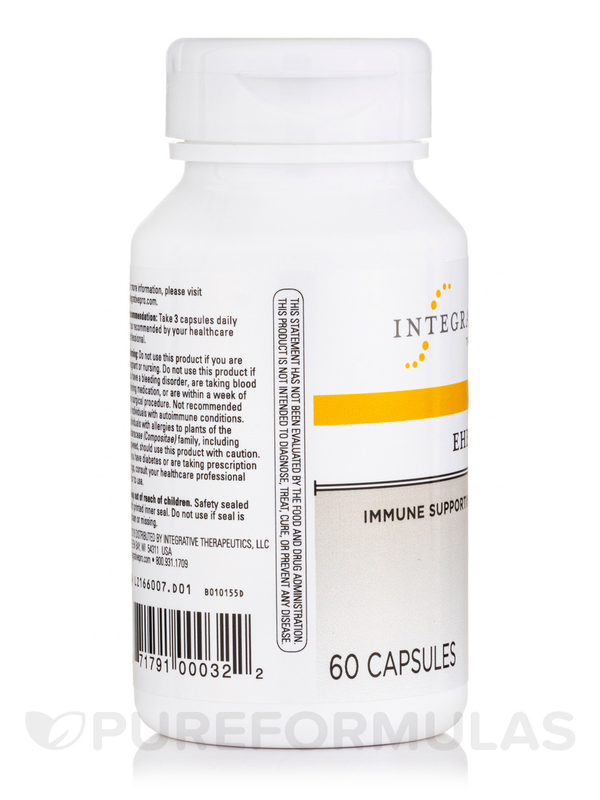 If you get sick often‚ you may want to take steps to strengthen your immune system. Your immune system sends white blood cells throughout your body where they’re needed to attack foreign invaders such as bacteria‚ viruses‚ and fungi. If your body doesn't have enough white blood cells‚ or if those cells are weak‚ they may not be able to protect you effectively. You may be able to promote healthy white blood cell levels by making sure that your body gets all the nutrients it needs. Vitamin A‚ vitamin C‚ vitamin B6‚ and zinc: nutrients that your immune system needs to operate efficiently. Citrus Bioflavonoids Complex: provides your body with antioxidants that may help you combat harmful free radicals‚ which are molecules that can damage cells. Echinacea: a proprietary blend that may help your immune system fight bacterial‚ viral‚ and fungal infections. Oregon grape root: may help reduce inflammation in your body. 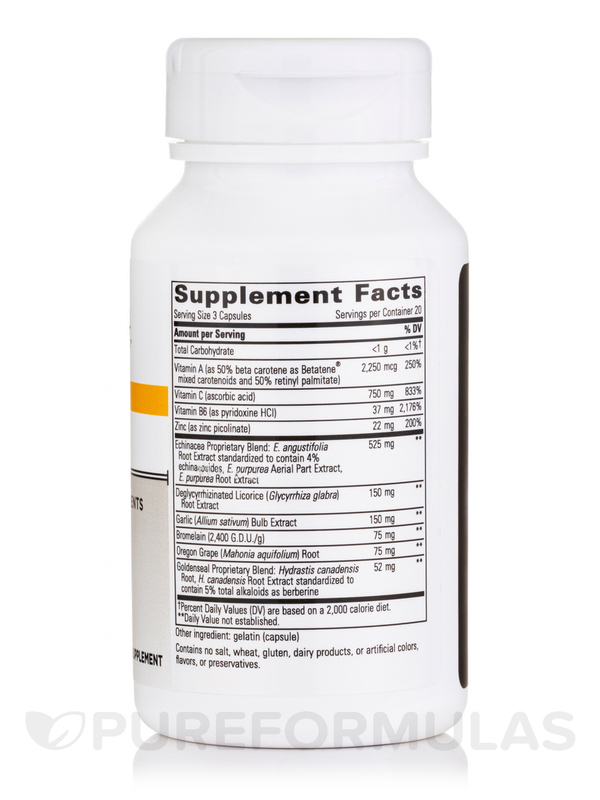 Goldenseal: a proprietary blend of Hydrastis canadensis root powder‚ H. canadensis root‚ and rhizome extract that may help your immune system fight off bacterial infections. 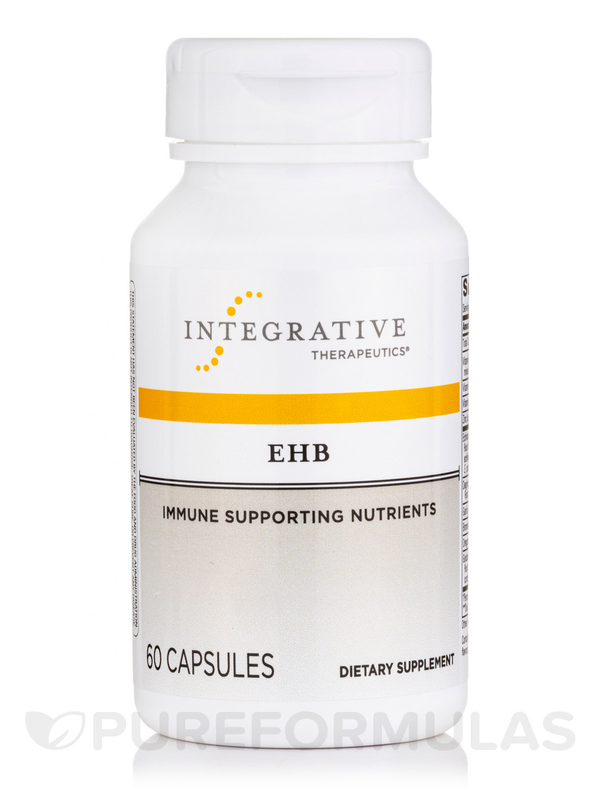 Each 60-capsule bottle of EHB by Integrative Therapeutics will last you 10 days if you take the recommended dosage of two capsules‚ three times daily. E. angustifolia whole plant extract; E. pallida whole plant extract‚ E. purpurea whole plant extract‚ E. purpurea aerial part extract‚ E. angustifolia root extract standardized to contain 4% echinacosides. 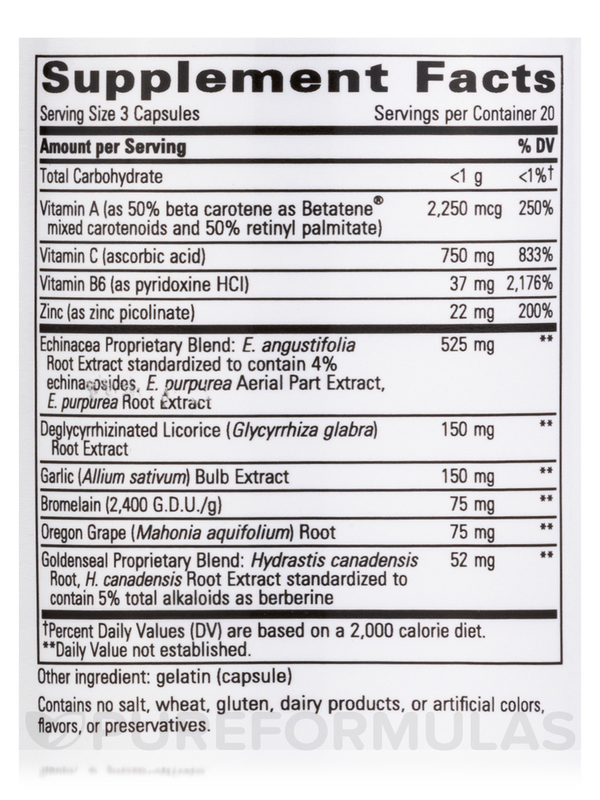 Hydrastis canadensis root‚ H. canadensis root and rhizome extract standardized to contain 5% total alkaloids as berberine. Contains no sugar‚ salt‚ yeast‚ wheat‚ soy‚ gluten‚ dairy products‚ artificial colors‚ flavors or preservatives. Take 3 capsules daily or as recommended by your healthcare professional. Do not use this product if you are pregnant‚ nursing‚ have a bleeding disorder‚ are taking blood thinning medication or are within a week or any surgical procedure. If you have diabetes or are taking any prescription drugs‚ consult your healthcare professional prior to use. 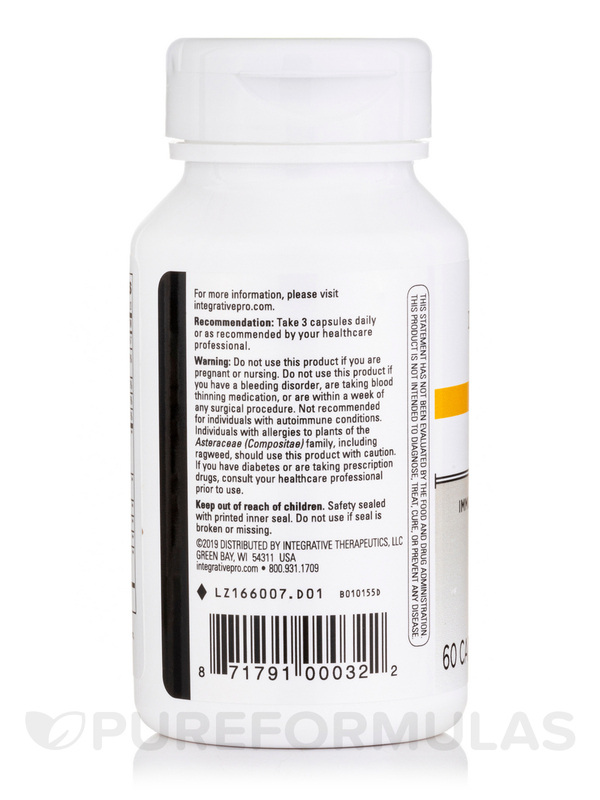 Allergen Caution: Persons with allergies to plants of the Asteraceae (Composite) family‚ including ragweed‚ should use this product with caution. I've been taking EHB by Integrative Therapeutics per doctor's orders and will not know the results for another week or more after blood test. Highly recommended by ND to boost immune system. I'm familiar with the ingredients and approve. The capsules are very easy to take. Not sure if taking echinacea for 2 months is a good idea after reading various reviews about its use over the years. My doctor prescribed EHB by Integrative Therapeutics for me - and with taking 6 a day, it only lasts 10 days, so I was very excited to find PureFormulas and be able to order it! The price is very close to what I paid at my doctors office. It shipped the same day I ordered it and received it in three days time. Very prompt, efficient and my order came with coupons inside! It seems to be the secret weapon for me to feel 'human' again rather than just a ball of pain living on my couch. My naturopath prescribed EHB by Integrative Therapeutics to me over a decade ago for recurring sinus infection and swollen glands after having mono. It immediately helped. I now always keep it in the cabinet for the onset of cold/flu/ailment. I can honestly claim this medicine has saved me and my husband more times than I can count. I always keep a bottle in the cabinet and travel with it for emergencies. It's truly my miracle medicine. So grateful to have discovered such a wonderful, high potency, effective, safe, product. Five stars! Works within 12 hours at early onset of cold. Our whole family is taking EHB by Integrative Therapeutics after having exposure to toxic mold. No side effects, taken with or without food. Did not bother his stomach. I purchased EHB for when I feel like I might be catching a cold. I take 2 Capsules 3x a day for a couple of days. I dont actually catch the cold. It nips it in the bud beforehand. EHB was recommended by my Holistic Dr. EHB works wonderfully & I would totally order it again & again! I love EHB by Integrative Therapeutics. My husband and I both use it if ever we feel a flu or nasty cold coming on and we feel better immediately. I also have used this twice now for urinary tract infections. I also need other herbs/supplements in this case but this has been recommended to me by two different naturopaths when I was experiencing UTIs. I was recently away on a trip and felt a UTI coming on. I was able to keep it at bay with lots of water and 2 EHB capsules every 3 hours until I could get home to other treatment the following day. Great product. Works great & no side effects. Im not sure how safe it is to take such high doses of Vitamin A very often. I have heard mixed opinions on this.